The Heart of Aromatherapy: An Easy-to-Use Guide for Essential Oils is now available! In this guide to safe and effective aromatherapy, Aromahead Institute founder Andrea Butje brings 40 essential oils’ unique properties to life for easy home usage. Each essential oil profile contains thorough practical information (Latin name, aroma, aromatic note, uses, and safety tips), as well as a “personality” profile to provide a sense of the core spirit, physical, and emotional supportive capabilities. Interspersed throughout the text are stories about individual distilleries and tips for buying the safest, most natural forms of the essential oils. Over 100 recipes are categorized for skin care, rest and relaxation, respiratory, digestion, pain relief, meditation and contemplation, and natural cleaning. Clear, easy-to-follow instructions are accompanied by safety tips and adjustments to make each recipe kid-friendly. With accessible information and recipes, both budding and experienced aromatherapists alike will be able to create personalized essential oil blends for happier, healthier bodies, minds, and homes. 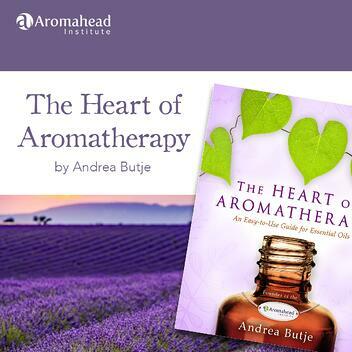 Andrea Butje is an internationally recognized aromatherapist and author. Her aromatherapy school, Aromahead Institute, reaches students from around the world thanks to her innovative online educational programs and her inspired approach to creating community. In 2013, Andrea was honored with a Lifetime Achievement Award from the Alliance of International Aromatherapists for the remarkable work she has accomplished in the aromatherapy profession. She lives in St. Petersburg, FL, and you can visit her online at www.aromahead.com.